...because I have no life. 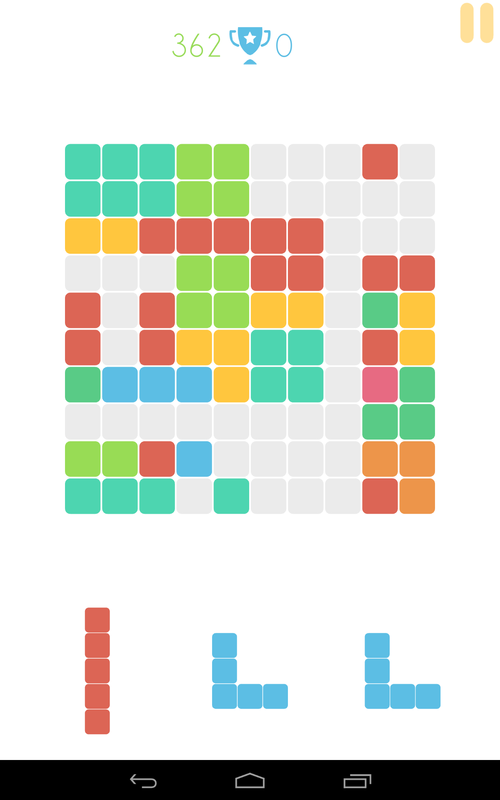 Perhaps one of the most simple yet addictive portable games I've ever played, 1010 is a puzzler that takes place on an appropriate 10 x 10 square grid and has gamers line up different shapes of blocks to make them disappear. 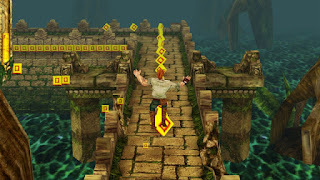 The player is given three patterns of blocks - and must place these onto the grid in any way they like. When all three are used, another three appear, and so on. The aim is to line up a row full of blocks, which will then disappear, giving you 10 points - you'll also get points for each block you successfully place onto the grid. When there is no longer any room on the grid for your next type of block, the game is over - there is no end, it's just about racking up a high score. The game gets more and more ruthless as it goes on, giving you blocks that aren't the easiest to use in your current situation, which can be frustrating but it equally presents an addictive challenge that keeps you coming back for more to increase those numbers. It's a simple yet extremely engrossing experience, testing your strategic abilities and constantly keeping you on your toes more so than many other modern puzzle games. 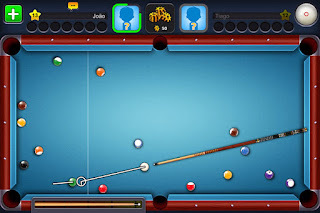 8 Ball Pool's title pretty much sums it up - based on the original Flash game, this little package allows you to play pool on the go, made easy with highly refined touch screen controls, polished physics, and useful targeting reticules. 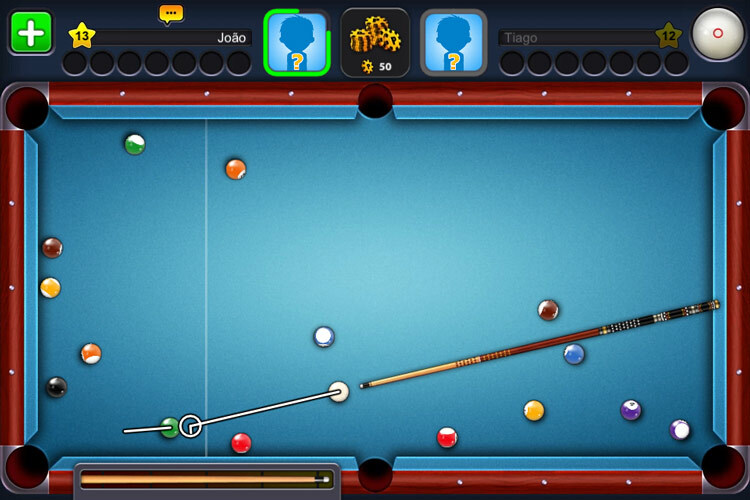 This makes it beyond easy to get to grips with, even for those not so good at pool in reality. The online community is massive, so finding a game is never a problem; and thankfully, you can compete in leagues that cater to your skillset, so you'll never be unfairly pitted against a stronger opponent. A shop system allows you to customise your cues and unlock new tournaments and game modes, expanding and adding further depth to the gameplay, even if the fact that everything seems to cost in-game money feels a bit absurd at times. These coins can be earned via giveaways, winning games, and betting in higher leagues; but it can be difficult to rack up enough to afford certain upgrades, and the only way to get more in a quicker manner is to actually pay for it - as in, with your own money. It's not as bad as it sounds (bar that last bit), but still a bit frustrating - equally so when there's not even a free single player mode to practice against an AI opponent, meaning you can lose a lot of coins by merely trying to practice online as a newcomer. However, with a rich online community and a polished overall feel, this is still an addictive mobile experience that's consistently fun and offers plenty of replay value. 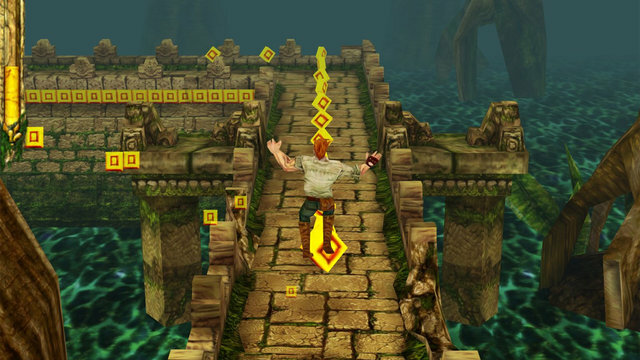 One of the most popular mobile games to date, Temple Run has you playing as a danger-loving explorer who must run from a band of monstrous apes (a large gorilla in the second one) after stealing a sacred artefact from their temple. You tilt your phone side to side to steer your character, with swipes to the touch screen allowing you to jump, slide, and turn down different pathways. The course is randomly generated as it goes on, so it's different every single time you play. Once you fall off the walkways, crash into a wall, or come forced to a halt in any way, you must restart - it's all about garnering a high score based on how far you can run and how many coins you can collect along the way. The first game is simple compared to it's successor, which boasts a number of new elements including mine carts, waterfalls, and ziplines, which present a number of new challenges, particularly once the pace picks up further into the game. What's most fun about these is the randomized course design, making the gameplay experience different each time and so it never feels too repetitive. There's a nice level of customization implemented, allowing you to play as various characters with different perks and weaknesses to see which can yield the best results. It's also one of the most impressive mobile games on a visual scale, and so if anyone hasn't yet given it a go after so long, now is the time to change that.